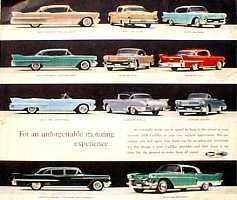 this was also distributed during the 1955 Motorama. around to putting better images on line. Dreams Do Come True ...with RH steering ? 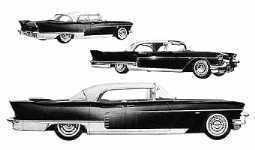 - Original Press Kit issued for the New York auto Show, January 1957 (only a couple of the press photos are shown below; you will find more on this page). 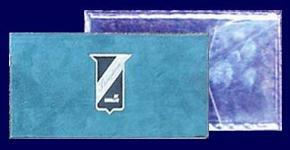 One of these press kits sold on Ebay, in December 2007, for over $2,000! owner's manual. Somebody had a Merry Christmas ! in November, 2003, by the owner of car #214 ...for $430 ! 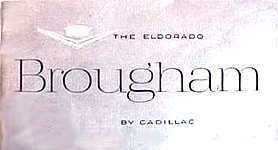 I suppose that is "nothing"
Magnificent Eldorado Brougham by Cadillac [below]. 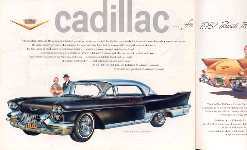 - the Owner/Operator manual for the 1957-58 models. one in April of 2008. I guess there's no turning back! 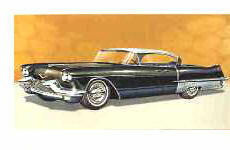 In one edition of a GM brochure illustrating the various models being offered to the public in 1957, there is a side view of a red Eldorado Brougham below a yellow Eldorado Biarritz; another shows a ¾ front RH view of the bespoke Eldorado Brougham; in yet another issue of that brochure there is a yellow Eldorado Seville model on the same page. This announcement will be of extraordinary interest to all connoisseurs of fine motor cars. 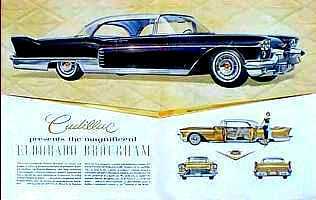 For the custom-created Cadillac Eldorado Brougham for nineteen fifty-nine is the most inspiring motor car the world has ever seen ! Dramatic in conception... elegant and luxurious in execution - it is Cadillac's crowning achievement. It is, as you would expect, completely fitted with Cadillac Air Suspension... Air Conditioning...Cruise-Control...and all the other Cadillac power assists, as well as with a host of new features and appointmernts unique to this magnificent motor car. We invite your personal appraisal during our special showing. models [see image, above, for the 1957 car]. 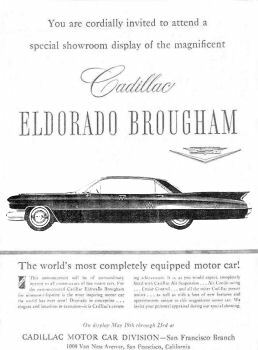 - the rarest and most desirable item of Eldorado Brougham merchandising literature is The Eldorado Brougham Color and Upholstery Selections book, a dealer showroom item measuring 19 x 8¼ inches. This book is about as rare (...and equally as [or MORE] valuable!) 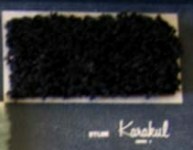 as the Arpège perfume atomizer. 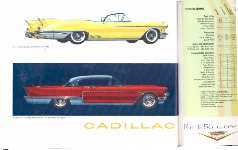 If you consider that a "regular" Cadillac color and upholstery book of the fifties may fetch $400-500 today, you may easily imagine what this one is worth! I know of only two (maybe three) such books extant: one belongs to BOA member Charles D. Barnette, who has Brougham #590 and he actually saw one other at the 1986 CLC Grand National in Fort Worth, TX. I wonder who has it today? The "third" item may just be the second one; it was acquired at the 100th Anniversary Grand National in Detroit in 2002 (price not disclosed). Late Extra [December, 2008]: that "second" or "third" item has changed hands once again; I am not at liberty to reveal the name of the current owner but he did accept to tell me that he paid not $170, nor $1,700 but $17,000 [!!!] to satisfy his craving to own one of these super-rare Brougham "artifacts". It' was probably a more sound investment, in 2002, than buying shares in one of the major US auto conglomerates! 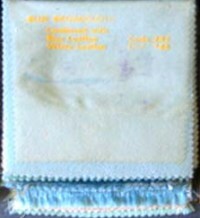 On the dark blue leather cover is what appears to be a sample of the car's brushed stainless steel roof. 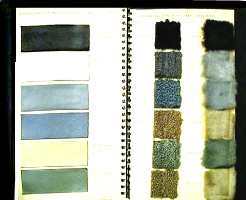 Inside (top half) are the two carpet samples [Karakul, code #1 and mouton, code #2] ; the lower half is divided into three sections: left are seven leather swatches, center are 16 cloth swatches and right are the 15 special Eldorado Brougham exterior paint selections; the last "page" in that selection groups together 24 small, diamond-shaped paint chips showing the 24 standard Cadillac colors which could be ordered also for the Eldorado Brougham; only fourteen of them were actually used; none were ordered in the following standard colors: Cheviot Gray metallic [code #14], Somerset Blue metallic [code #24], Turquoise [code #28], Peacock Blue metallic [code #29], Acadian Green [code #30], Regent Green metallic [code #36], Calcutta Cream [code #40], Alamo Beige metallic [code #42], Meridian Taupe metallic [code #49, which is much like the 1959 Persian Sand hue], or Tahitian Coral metallic [code #48] ...in my opinion, those last two colors would have fit the Brougham perfectly! 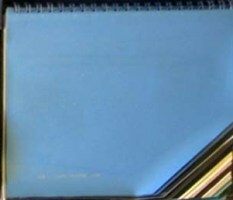 The book was made by the Display Corporation of Milwaukee, WI. 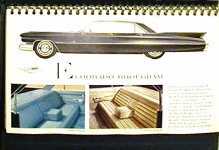 Once again the rarest and most desirable item of Brougham merchandising literature is The Eldorado Brougham Color and Upholstery Manual, a dealer showroom item that is as wide as the year's Dealer Data Book and twice as tall. Like the 1957-58 edition mentioned above, the book was made by the Display Corporation of Milwaukee, WI. It was not previously listed here as I was not sure of its existence. Now there is no doubt about it according to Eldorado Brougham owner, Jean-Claude Franchitti (58EB#479, 59EB#23, 60EB#58 and 60EB#68) who was able to admire one, in 2004, in the collection of an Ohio resident. 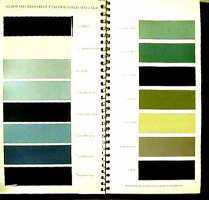 The book shows all possible interior combinations in both leather and cloth. He knows of only three such books in existence. 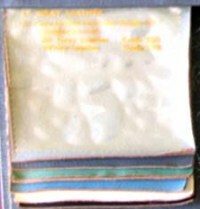 Apparently the same one was used for both years (1959 and 1960). As a matter of interest, J-C reports that one of these books sold on eBay in the latter part of 2004 and fetched more than $5000 ! That almost puts to shame the prices achieved over the last 2-3 years for the Arpège perfume atomizers that were "standard equipment" on 1957-58 Eldorado Broughams. 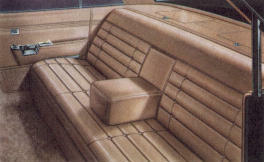 I am equally grateful to Jean-Claude for sharing with us the images (below) of his own, ultra-rare color and upholstery book for the 1959-1960 Eldorado Brougham. 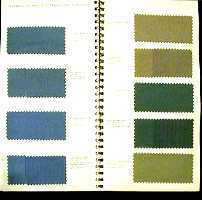 metallic, Cypress green metallic, Covert, Sandalwood, Kenya Beige and Plum metallic. 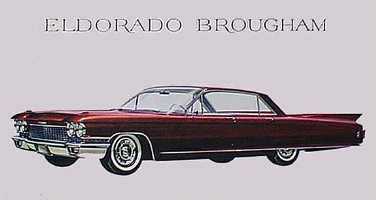 No fanfare introduced the 1960 Eldorado Brougham models. About thirty chassis were made ready as soon as the 1960 standard production line got rolling. These were shipped to Pinin Farina in Italy, as had been the 59 chassis the previous year. 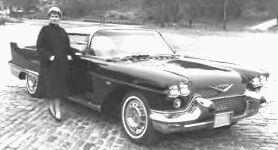 No 1960 models were ready for delivery until about March that year. 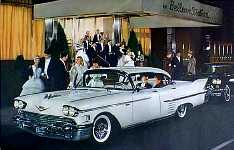 One assumes that Cadillac was losing so much money on each Eldorado Brougham sold that it had been decided not to encourage sales of that particular model. 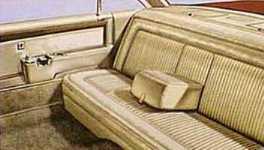 the covers are made of gray leather, embossed with the Brougham badge. This ultra-rare manual sold at auction (on eBay) in 2003, for $2000 ! 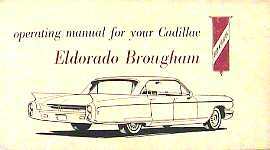 In addition to the foregoing material, I had all the dealer mailers from 1957 through 1960, some of which include photos and artists drawings of various Eldorado Brougham models. 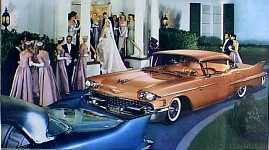 There's a good story about the 1957 Eldorado Brougham on the Hemmings webpage (car #107). 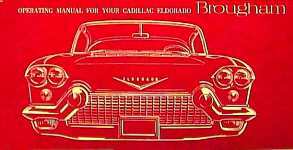 This one is painted bright red and was owned first by Calvin J. Werner, Cadillac President and General Manager from September 1, 1966 to June 30, 1969. The article appeared first in Hemmings Classic Car for August, 2005.